Tethys takes a comprehensive approach to enzyme and metabolite discovery. Many enzyme companies utilize costly high throughput technologies to vastly increase the numbers of samples screened. The power of the methodology is undeniable, but so are the weaknesses. Organisms that are not amenable to high throughput screening methods are ignored, and proteins that are not expressed effectively by standard DNA molecular cloning techniques are not detected. Tethys uses an integrated approach to design individualistic strategies for given targets, using human technical expertise and brainpower instead of robotic strategies. The Tethys approach searches a smaller number but wider variety of microorganisms chosen on the basis of a specific target’s desired characteristics. 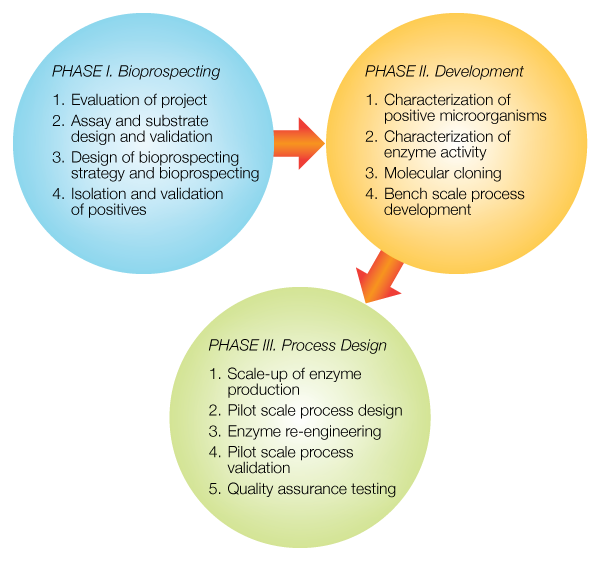 Our methodology is particularly well suited to the discovery of novel enzyme activities for which no convenient genomic or combinatorial hook exists. Our deep expertise in microbiology, molecular biology, enzymology, biochemical engineering, and bioorganic chemistry provides a unique discovery platform.